Got this message from Juliana who is a messenger for breakaway courier. She is throwing an alleycat in NYC to help aid with the disaster relief in Japan. Come out and celebrate the hanami like a track star! Never raced before? Pop it with us at Chari & co, and let the vets show you how it’s done. 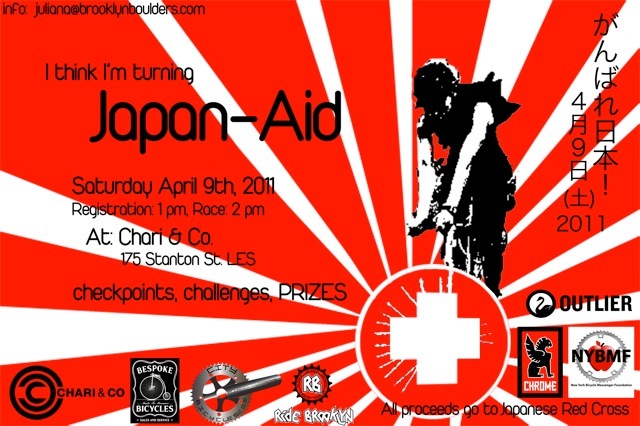 Race for a good cause, and come help the New York Bike Messenger Foundation show some solidarity with our friends in Japan. Wacky challenges and a course that incorporates Japanese cultural landmarks in our own fair city. check points, challenges, and PRIZES!! Donations and sponsored matches welcome. Read more at the Facebook events page.